On the Podcast this week, from an October 19th, 1951 NBC Radio Broadcast of The Dean Martin and Jerry Lewis Show, the boys welcome seminal crooner Bing Crosby to the program. Dean sings I Wish I Was. The team does a sketch featuring Little Man You've Had A Busy Day, and Dean and Bing duet on Sam's Song. Dino also reminisces with I'll String Along With You. You can also get every show automatically by subscribing for free at iTunes. 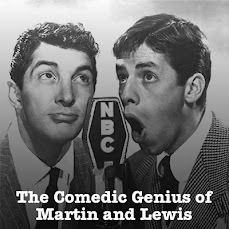 Get Jerry Lewis On Comedy and Jerry Lewis Phoney Phone Calls free with our eMusic trial. Just do a search for Jerry Lewis once you sign up. Both Three Ring Circus and Money From Home are available on ioffer.com for around ten dollars. You can also find a lot of unreleased Dean solo movies and Jerry solo movies that are not released.